Spirit of Ramadan inadvertently led me to become Muslim ~ Islam My Ultimate Decision . I have been sharing personal accounts of non Muslims who have embraced Islam in my previous number of posts. And each personal account has a different motivation that has led a person to embrace Islam. Today I am sharing the personal account of Lauren Booth, who is a broadcaster, a journalist and also sister in law of Britain's ex prime minister Tony Blair. In her account which has been published in the Islamic Bulletin, she says that she visited a family in Rafa refugee camp and met a family of sixteen cramped inside a tent. She was greeted by the woman of the house and when she ushered her in, she asked her what it had been to live in a refugee camp during the month of Ramadan with almost little or no food? And the woman replied, "Allhamdulillah!! with such joy I couldn't help but smile. And as I sat there on the floor of this home eating what little leaves that they had; a bit of hummus, a pita bread that was our Iftar. "So, I turned to this sister and I said: " With all due respect I want to ask you, why does your God starve you in Ramadan? Why do you fast in Ramadan...sister, just explain to me? This lady who never owed a hand bag, whose children didn't have, never have shoes. Whose children I was sitting with didn't have pen or paper to do any drawings, she said to me: "Sister we fast in Ramadan to remember the poor" and a key went to my heart and unlocked it." Later she visited Iran and visited the Fatima Mosque, named after the beloved daughter of the Prophet Muhammad (peace be upon him), the prophet of Islam. There she says she made a simple prayer: "Allah don't give me anything. I have everything. Thank you for this journey, but Allah don't forget the people of Palestine." There she saw families with their children moving about in the courtyard of the mosque who were busy in their religious chores. She slept the night there and woke when the call for the pre dawn prayers was called. She said that just to be with everyone around, she offered prayer like everyone did. But she was still not for Islam in any way so far. But a candle of truth had been alight in her heart and when she returned to London, a few days thereafter, she embrace Islam. Then she says she opened Qur'an for the first time and opened the first surah of Qur'an Surah Al Fatiha and said: "Hello Sarah where have you been, welcome to the religion of peace, joy and tranquility and I couldn't put it down. Someone once told me and I feel much like that before Islam I had given up on God but God never gave up on me. Allhamdulillah." 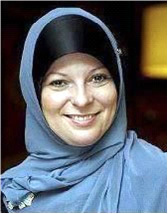 1-Mummy when you're a Muslim will you still be mummy? I said: When I am a Muslim you know what, I will be a better mummy, they said: "Horrayyy!!" 2-Mummy will you drink alcohol? When I am a Muslim I will never drink alcohol again and they said "Horrayyy!!" 3-And this is an interesting and thought provoking question from girls as small as 8 and 10: When you're a Muslim will you show your chest? I said why would you ask such a question? They said when you come to the school and your chest is showing we are embarrassed and we hate it and we want you to stop it. When I am a Muslim I will cover all this area and to which they said: "we love Islam." 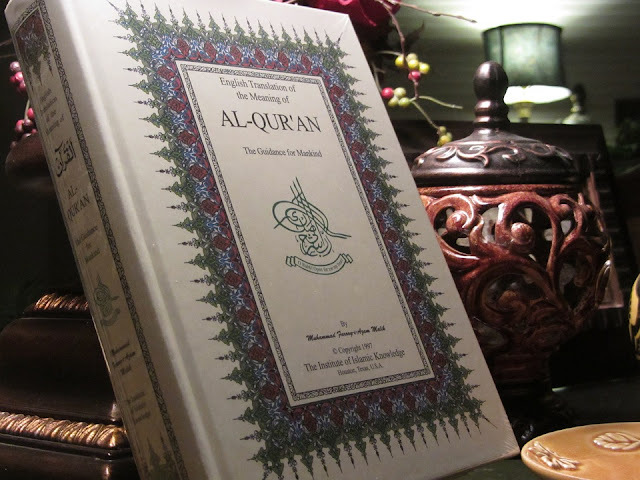 She says reading Qur'an everyday strengthens one's Imaan (Faith), better than yesterday everyday.She says: "If you live in a non-Muslim country those of us who do it can go very low very quickly, you must read the Quran. Most of all your just not on the path of Islam if you come to Islam like me, if you're a Muslim you are on the path as well so make sure that you don't miss those signs in everyday life. All praise is to Allah (swt)."